This is the original live double album release that has captivated fans for years. It is actually a compilation of tracks from three shows - from The Troubadour in Los Angeles, from Santa Monica and from London's Rainbow Theatre. You would never have known, as it plays like one full concert, which gives it undoubted plus points. It is up there with the true contenders for the "greatest live album of all time". Van is in total control of his large, brass-dominated band, instinctively and intuitively so, from beginning to end. The opener is an old blues cover given the full horn-driven Celtic Soul treatment and "Warm Love" gets the full brass enhancement. The sound on the remastered CD is just so damn good, it takes your breath away. "Into The Mystic" is one of those seemingly effortless pieces that Van just owns. When he sings "I wanna rock your gypsy soul" and the band kick in, it is just one of those moments. Morrison utilises two violinists and a viola player on these track and their contribution is wonderful, as is that on the bass of Bill Attwood and Jack Schroer. It is during this period that Morrison really developed his on stage Celtic soul improvisation, his "backstreet jelly roll" that would so positively characterise his stagecraft from now on. He was also, by his own admittance, really discovering a love of playing live. Just listen to the jaunty "These Dreams Of You" for conclusive proof of that. The saxophones are superb on this track also. "I Believe To My Soul" is a bluesy Ray Charles number given a suitably bluesy, but sumptuously brassy overhaul. "I've Been Working" is a lively, almost funky at times, workout, with that great "woman, woman, woman..." vocal riff. The upbeat blues of "Help Me" rocks along. Morrison can trot out these numbers in his sleep. "Wild Children" sees him all Celtically nostalgic and reflective. It is a beautifully laid-back, soulful number with a delicious piano break in the middle. As "Domino" kicks in with is uplifting horn riff and Van's great vocal I realise just what a consistently superb album this is and that there is little point dissecting track after track. No need. They are all great. My goodness, just put "I Just Want To Make Love To You" on, right now. 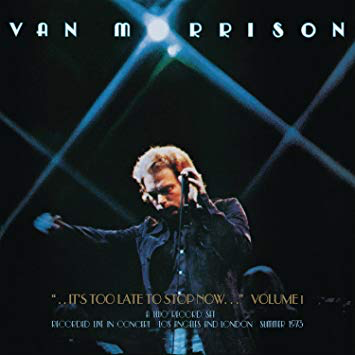 Special mention has to go out to the conclusion, however - "Caravan" is one of the best live cuts I have heard by anyone, let alone Van Morrison. The violin solo in it is just magnificent and life-affirming. Live music simply doesn't get much better than this. Unbelievably highly recommended.